Description: Waiting at the Seward Station to head north. Description: With its mis-matched number boards, ARR 3009 swings the daily Glacier Discovery north next to the Seward Highway. 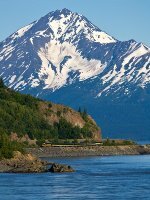 Description: Another of the endless postcard-like settings of the Alaska Railroad south of Anchorage. Here the Glacier Discovery works its way north through the beauty. 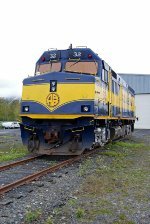 Description: ARR 32 leads a southbound past the old loading dock for the Whittier Shuttle. The line to Whittier is seen diverging to the right of the photo. Description: ARR 32 leads the Glacier Discovery over Placer Creek and is about to enter Portage Tunnel. 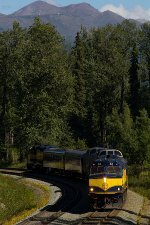 Description: The Alaska State Fair Train is inbound to Anchorage with a load of people returning from the State Fair in Palmer. This train ran two weekends this year and ran four shuttles back and forth each day. 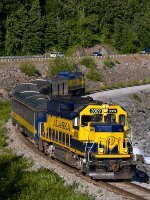 Description: After picking up another load of passengers in Anchorage, the Alaska State Fair Train is running back north Palmer and the state fair. ARR 32 brings up the rear of this northbound move. 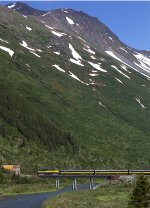 Description: ARR 32 leads the Alaska State Fair Train south through Elmendorf AFB with the Chugach Mountains poking up in the background.